A while back I was searching for a way to launch applications on selected file(s) in the Mac OS X Finder using Hotkeys. This is different from launching the default application (Cmd-Down, Cmd-O or Double-Click the mouse) for a file as I sometimes want to launch different applications on the same file types - like a 'Right Click-Open With' using a mouse, or dragging a file onto an application in the dock or in the applications folder - but with fewer clicks and (more importantly for me) without using the mouse. For example, I want the currently selected file(s) in the finder to be opened with TextMate when I hit Shift-Cmd-T, to be opened with 0xED when I hit Shift-Cmd-X and to be opened in VLC when I hit Shift-Cmd-V. I have managed to get this working and find this to be a great time saver, so I thought I'd share it. It starts with a great free tool called Spark, which takes you halfway there. To get all the way there you need to add in a little AppleScript. 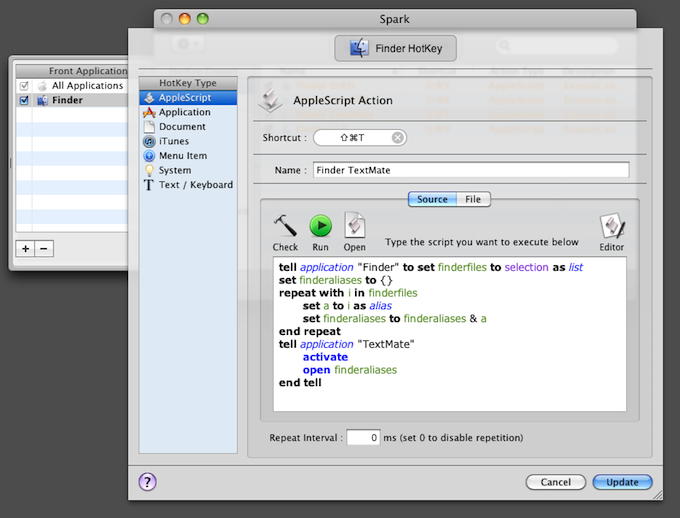 Open Spark.app, change the context from All Applications Hotkeys (on the top) to Finder HotKey (you may need to add Finder as an application in the left pane first). Ensure that the Spark daemon is running (the status is shown on the main Spark application pane). You can now close the Spark application and only need to open it if you want to add or change shortcuts. Repeat the above process to add other shortcuts, changing the application name as appropriate.